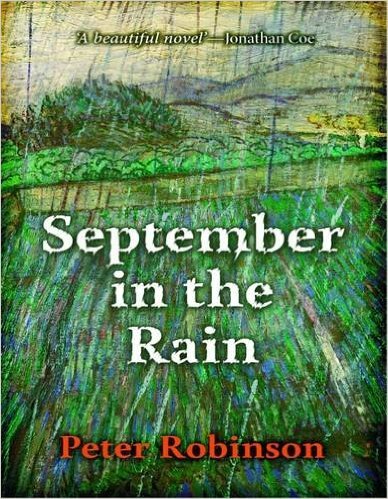 Peter Robinson’s September in the Rain: A Novel is published today, the first of September 2016. For the two young people found out in the rain one September night nothing can ever be the same again… Together through university, Mary and Richard have long planned their journey to Italy. But in the months leading up to it, Richard begins what she will call ‘a brief affair’ with Alice. Then a series of small decisions leads to disaster. In delicately evocative prose, Peter Robinson carefully, painfully, and beautifully depicts these relationships before and after the traumatic events at the heart of his first novel. September in the Rain is vivid narrative of young love in difficulties, its choices and dilemmas, responsibilities and distances, the consequences of guilty feelings and violent transformations. This entry was posted in Department of English Literature news and events and tagged Department of English, Department of English Literature, English Department, English Literature, Professor Peter Robinson, Reading, September in the Rain, University of Reading. Bookmark the permalink.